A shortish walk on the lower slopes of Baugh Fell visiting the numerous gills and waterfalls to be found above Hebblethwaite Hall Gill. This was the second of two walks I did in the same day in the Rawthey valley either side of a lunch date with some friends in Sedbergh. After a fabulous morning waterfall hunting in Uldale it was now time to see how the waterfalls in the numerous gills above Hebblethwaite Hall would measure up. Starting from the layby signposted as a picnic site a half mile north of Straight Bridge I walked a short distance north up the road before turning off on to Hebblethwaite Hall Lane. A pleasant hedgerowed country lane, the verges were made more colorful by numerous wildflowers including bluebells, dandelions and marsh marigolds. Passing in between the buildings at Hebblethwaite Hall I suddenly came across a field full of alpacas, certainly not what I was expecting to see! Although initially startled by my appearance they also seemed quite curious, though not enough to get too close. This was probably a good thing as I’m not sure how I would have felt at being surrounded by alpacas. Walking across Cow Pasture (thankfully no cows) and High Pasture I finally reached access land and the first gill of the afternoon – Nor Gill. The first couple of falls were no more than a foot or two in height and, after I’d made a brief detour north to visit what turned out to be a dry waterfall in a neighbouring gill, I began to feel a bit underwhelmed. Thankfully upon returning to Nor Gill and heading further upstream I came across a much more substantial waterfall, at least fifteen feet high. This particular waterfall featured rather more moss than water but in wetter conditions it would look quite impressive. From the top of Nor Gill I crossed a rather desolate section of tussocky moorland to reach the scattering of stones marked on the map as Askew Stones. Really how such a minor feature justified appearing on the map I don’t know. Perhaps the OS surveyor was just thankful to come across something worth labelling! From Askew Stones I crossed Far Askew Gill and then followed Near Askew Gill down into Far Gill Laids. Here I came across another small waterfall. A far better waterfall awaited me further downstream in what was now Penny Farm Gill. From this latter waterfall I climbed back up out of the gill to exit access land into some grassy pastures. Looking back down I was struck by the precipitous rocky sides of Penny Farm Gill. It didn’t look accessible from the waterfall but after re-reading Wainwright’s ‘Walks on the Howgill Fells and Adjoining Fells’ I’m not so sure and Penny Farm Gill is definitely a place I’d like to go back and explore. After walking through a couple of pastures, marred by the presence of lots of black bin liners, I dropped down to a footbridge to cross over Hebblethwaite Hall Gill. The steep bank on the far side was made more colorful by a nice display of bluebells. Once back at the hall it was then a simple case of retracing my earlier steps back along Hebblethwaite Hall Lane. While there is no doubt that the waterfalls I found paled somewhat in comparison to those I’d found in Uldale that morning this was still an interesting if not essential walk in unfrequented country. Just read your write up on the Heblethwaite Hall walk. I did something very similar with a friend about a year ago and was similarly impressed with this lovely area that we do not normally visit. Like you we were appalled by all the black plastic lying around and also by finding a lamb abondoned and unable to stand! 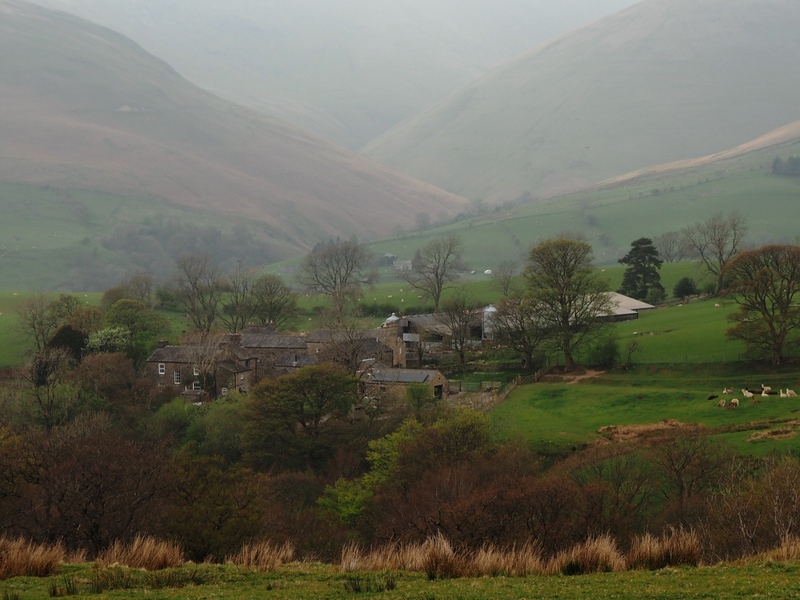 We went out of our way to visit the farm of Sarthwaite to report what we had seen only to be told they knew about it, same land as the black plastic! What a shame that in such a lovely spot there could be such a lack of care. Hi Sue, I totally agree. It is a really disappointing to come across places where the landowner takes such little care of their land.